Ukaine band Inside The Sound basically started as a side project, led by guitar player and keyboardist Max Velychko and his friend: bass player Dmitry Trifonov. Both musicians have been playing in several bands, before taking this project to a higher level. In 2007 the next level was reached when Inside The Sound's instrumental debut album; Time Z was released. An album recorded with a befriended drummer and keyboard player. In the year 2017 Inside The Sound returned to the scene with a successor; Wizard's Eyes. This time the duo again forms the base of the band and the drums on the album were recorded by Dmitry Polevov and Alexander Yermolovich. Special guests are presented on violin, table, sitar and keyboards. Although inspired by the instrumental music of Liquid Tension Experience and guitarists such as Steve Vai, the music on the album shouldn't be compared to these musicians. The opener Intro: A Secret Journey reminds me a lot more of the Hungarians Special Providence than the aforementioned bands. Resulting in a very nice combination of guitar riffs and spacey keyboards and a rock solid rhythm section. The addition of spoken word parts are a nice delicate touch. Other tracks, like Dreaming Deja Vue or Empire V combine a light djenty, but technical rhythm with spacey keyboards. Let's say; Virgil Donati's In This Life with the addition of Special Providence's keyboardist. But the majority of the tracks are a very fine blend of instrumental progressive rock, enhanced with dashes of jazz rock and fusion. A track like Friends is a nice showcase for the guitar driven element of Inside The Sound and the addition of the Jean-Luc Ponty referring violin enhances the jazzy feel of the song. Although the album has numerous guitar lines and melodies, the balance between guitar and keyboards is perfect, during some of the tracks I imagen the basics were written on keyboards and has the guitars improvising over them in the beginning. Other tracks, besides the mentioned ones you would not like to miss are the title track; Wizard's Eyes and the over seven minutes long To The Sky. Interesting in combining different progressive elements into the songs; mood and tempo changes, powerful parts that go alongside subtle keyboards parts and lots of soloing. 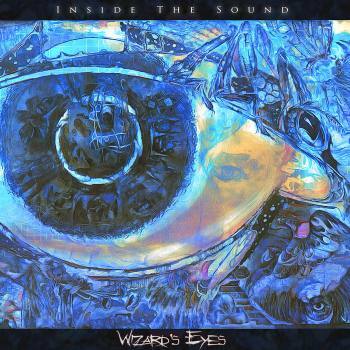 In my opinion Wizard's Eyes will appeal to a fairly broad audience, guitar freaks will absolutely like the music, and the progressive rock fan will be pleased with the album's structure and appealing tracks. Even the jazz rock and fusion fans should take a listen, for there are lots of elements to discover on this quite impressive album. I don't know if the bonus track is only available on the digi pack version, but I would recommend to pursue the digi pack, just for this beautiful addition.